A rattlesnake bite can be deadly to your cat. Though your kitty loves to chase lizards, reptiles are definitely not a cat’s best friend. There are many reptilian species that are toxic to cats. One bite from these venomous creatures could leave your kitty on the verge of death. Understanding which reptiles pose a threat could save her life. All members of the pit viper family are toxic to felines. This includes rattlesnakes, water moccasins and copperheads. These snakes have hematoxic venom that interferes with the coagulation of blood. 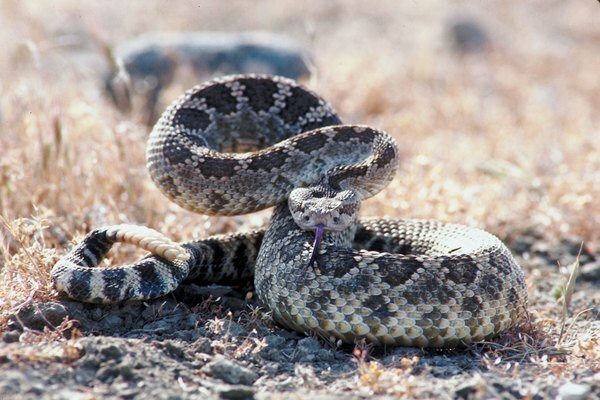 Some subspecies like the Mojave rattlesnake have neurotoxic venom. There are two lizards poisonous to cats, the Gila monster and the beaded lizard. These lizards inject toxic venom with each bite; once these lizards latch on, they don’t let go of their prey easily. Good news though, your cat will most likely never come into contact with either of these lizards unless she’s in the remote desert or takes a trip to Mexico. Reptiles aren’t the only threats to your kitty. Toads of the Bufo species are poisonous to cats. These toads spray toxin at their victims. Any contact your cat has with bufotoxin can be deadly—cats can die within an hour. Signs of bufotoxin include: drooling, head shaking, rapid heartbeat, muscular weakness and vomiting. Immediately take your cat to the vet if you suspect she has been bitten by a reptile, especially if its known to be poisonous. All bites, even nonpoisonous ones, involve bleeding and swelling and can lead to infection. Venomous bites can lead to death. It’s imperative that you keep your cat calm and still (or as still as possible) if she’s bitten. Keeping her calm will stall the venom’s spread throughout her body. Rush her to the nearest veterinary hospital; don’t waste any time looking for the reptile in question. The best way to prevent a bite is to limit your cat’s interaction with reptiles. The easiest way to do this is to keep her indoors. There are some steps you can take to reduce snakes around your yard if your cat must go outside. Try trimming back overgrown bushes or tall grasses so they’re not easy hiding spots. Snakes also love to hide under rocks to escape the heat. Having large, ornamental rocks makes unsafe areas for your kitty. Managing the rodent population is another way to manage the reptile population. This will cut down on any unfortunate meetings between a venomous snake and your kitty. Are Lizards Toxic to Cats? What Are the Causes of Weight Gain in Cats? What Foods Are Harmful to Cats? Can Stressing Out Cats Really Make Them Sick? What Are the Causes of Cats Getting Head Congestion? How Much Food Does an Adult Cat Need Per Day?